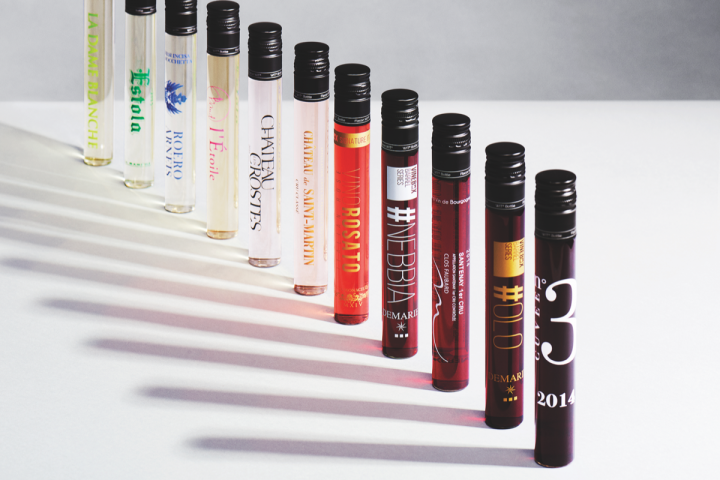 Founded in late 2014 by Matt Dukes, Vinebox provides Old World wines to subscribers in 3.4-ounce vials (pictured). Vinebox partners with 40 to 50 boutique European producers; their small sizes, Dukes says, is a core strength of the company. While working at a vineyard in Bordeaux in 2014, Matt Dukes came across the wine re-bottling technology that would eventually inform his start-up company, Vinebox. “For a tiny producer making around 3,000 bottles a year, it’s very prohibitive to send out full-size bottles to négoçiants and restaurateurs in the name of getting exposure,” Dukes says. “So the French came up with this sampling method to help small producers, where they place their wine in tall, slender tubes that perfectly preserve quality, as if it were in a full-size bottle.” Dukes loved the format, especially the fact that consumers could easily transport and sample wine without waste. Upon his return to the U.S. in late 2014, he launched Vinebox: a wine subscription service that offers unique, small-lot wines packaged by the glass, rather than by the bottle. 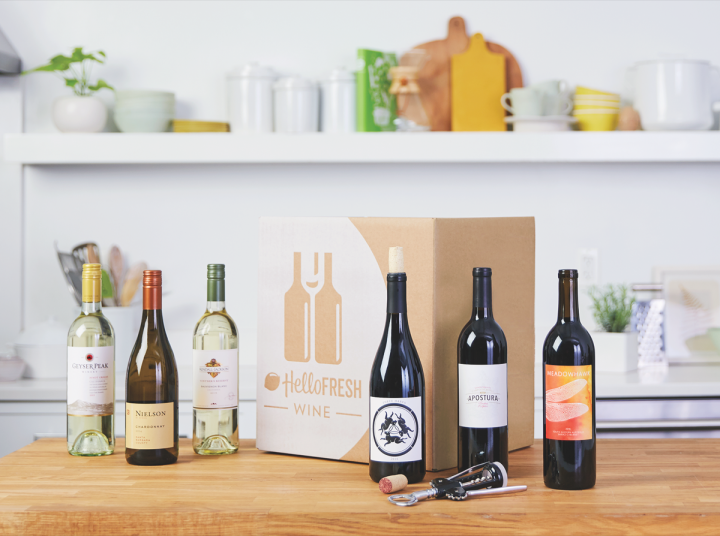 Major companies such as HelloFresh (wine subscription box above), Blue Apron, and Martha Stewart now offer wine delivery boxes. HelloFresh's monthly package includes six 750-ml. bottles and can be paired with the company's weekly meals or enjoyed on its own. Originally launched in 2012 as Club W, a digital wine club, Winc rebranded to its current iteration in 2016 to better showcase its fully proprietary portfolio of wines. Today, the company yields around 300,000 cases of its own wine, made with grapes sourced from across Chile, Argentina, Italy, France, Spain, New Zealand, Australia, South Africa, and California. As part of the relaunch, Winc also moved into the retail sphere, and the company now offers a number of its labels at various independent retailers and Whole Foods locales nationwide. Winc gathers information from consumers via a brief questionnaire, which the company uses to generate specific offerings likely to appeal to that person’s taste. The site also allows for full customization of shipments, ultimately letting users build their own cases. “By doing this, we’re able to have a two-way conversation with our customers,” Smith says. “We can truly get a sense of what people like, and why they like it, which informs our future wines.” The standard Winc box comes with four 750-ml. bottles, each ranging in price from $13 to $42. In addition to the flurry of new companies, a number of big-name players from other industries have recently launched wine subscription services of their own, giving additional credence to the movement. Meal kit provider HelloFresh, for example, introduced HelloFresh Wine last spring. While the service aims to work in tandem with the flagship’s weekly food menus by offering specialized food-and-wine pairings, it can be used as a separate entity as well. Each monthly shipment—available in red, white, or mixed case packages for $89—includes six 750-ml. bottles sourced from around the world, all of which are designed to be solid representations of their respective varietals and regions, according to chief product officer Stacy Gordon. “The wines we offer are approachable and easy to drink, making them an excellent option for those who are just beginning to explore wine,” she adds. Other major companies that now offer wine subscription services include Martha Stewart’s Martha Stewart Wine Co. and fellow meal-kit provider Blue Apron’s Blue Apron Wine. For many native digital wine subscription sites, offering wines that cannot easily be found outside of the service is essential to attracting new consumers. “One of our core strengths is that we’re working with small producers,” says Vinebox’s Dukes. “None of our wines are private label—they’re produced at vineyards that you can go and visit, and because of their boutique nature, they’re often not widely available in the U.S., which is a valued prospect for our members.” Vinebox launched a repurchase feature in the final quarter of 2017, in which consumers can buy 750-ml. bottles of the sample-size wines they particularly liked. Dukes notes that this has already become a key value-add for the company, which now acts as the sole importer for a number of international labels. In a similar vein, California Wine Club (membership starts at $40 a month for two bottles) focuses on purveying small-batch, artisan wines, most of which can only be found at their respective wineries. Meanwhile, services like Winecrasher have taken the opposite route, capitalizing on consumer reliance on ratings. Winecrasher offers an 89+ Points club ($110 for a mixed half-case) that exclusively features wines highly rated by such top critics as Wine Spectator.